The standard QRS Test Roll is designed to help the user determine Seven basic operating characteristics of any regular 88-note player piano mechanism. They are: General Leakage, Tracking, Tempo Control, Scale Uniformity, Repetition, Capacity and Auto-Sustain. For reasons which will be explained later*, the QRS Test Roll only tests 82 of the 88 notes. The Test Roll also has perforations at the end of the roll to test the function of an Automatic Rewind device if one is present. It should also be noted that the tests on the roll are not individually marked or named. Therefore, small graphics are included below as necessary to help you determine which portion of the roll performs which test. Before using the Test Roll, play each key on the piano by hand, and write down any problem or inconsistency. 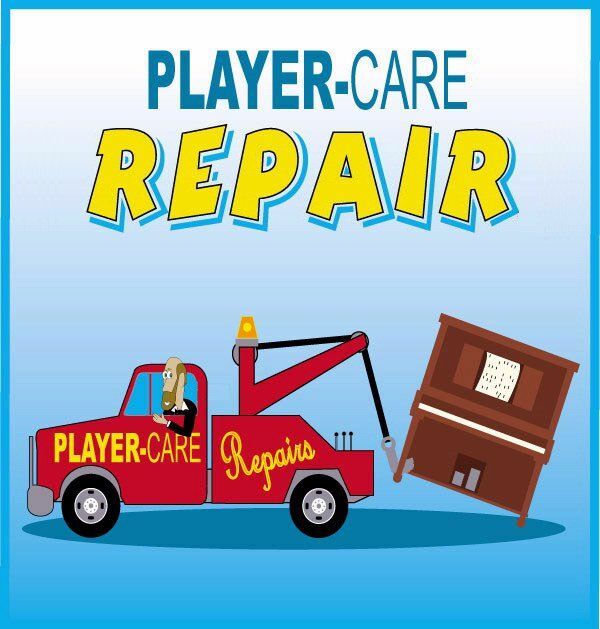 Remember: The player mechanism cannot play the piano any better than the piano plays by hand. Before You Begin: Use a Trackerbar Pump and 'Pump the Bar'. 1) Place the Play/Reroll Lever in the Reroll position. This action disengages the Take-Up Spool from the Transmission, allowing the Take-Up Spool to turn freely. 2) Place the Test Roll into the upper portion of the Spoolbox by depressing the Spring-Loaded Spindle on the left with the flange on the left end of the music roll, and then guide the Slotted Flange on the right side of the music roll onto the Slotted Drive Chuck on the right. Be sure that the slot in the flange lines up with the protrusion on the chuck. 3) Pull the End Tab on the music roll down and over the Trackerbar, and connect the End Tab to the small Hook on the Take-Up Spool. 4) Turn the Take-Up Spool around by hand One Full Turn, insuring that all of the Note Holes in the Trackerbar are completely covered with blank paper. 5) Move the Play/Reroll Lever to the Play position. 6) Move the Tempo Control Lever so the needle on the Tempo Indicator points to '0' (Zero). 7) The unit is now ready to start testing. Performing this test is quite easy. Simply start pushing alternately on the foot treadles at a rate of approximately one push per second. In a perfect world, you should only be able to push on the treadles three or four times (full pumps) before they resist being pushed any further. Next, move the Tempo Control so the indicator needle points to '10'. Give the treadles three or four full pumps and then count the number of seconds it takes before the roll stops moving. In a perfect world, it should keep moving for about 5-8 seconds. NOTE: One of the most important tests of any player piano mechanism is determining how well it can hold vacuum. The degree to which the system holds vacuum is directly related to the overall efficiency and function of the player mechanism. 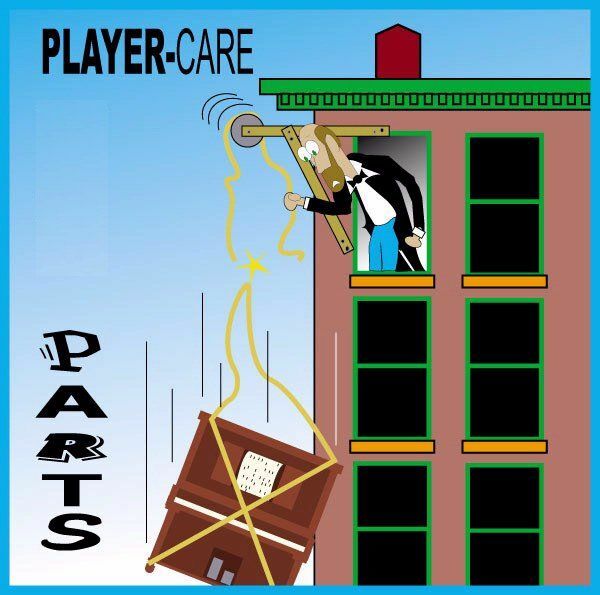 If the player mechanism is incapable of holding vacuum for at least a few seconds, one or more of the components in the system is leaking and should be fixed. To help you locate which component/s in the system is leaking, go to the "Test Your Player" web page - click here! After completing the leakage test, Rewind the roll to the beginning and put the unit back in the Play mode. Then set the Tempo to '70'. NOTE*: The first series of perforations on the Test Roll are designed to test the operation of 82 of the 88 notes. The Very First Note on the test roll is MIDDLE 'C'. (If Middle "C" is not the first note that plays when the first perforation passes over the trackerbar, there is a relatively serious alignment or tracking problem. There are no perforations on the Test Roll for the first and last three notes. This is because many player manufacturers used those holes for other operations such as Auto Rewind, Auto Shut-Off and/or Auto Repeat. 2) As the perforations in the roll pass over the holes in the Trackerbar, check to see that the holes in the Trackerbar are being fully exposed (or opened 100%). If you have a hard time seeing what is happening, reduce the Tempo as necessary. 5) When you stop activating the sensors manually, the roll should return to a position that is equidistant between the two sensors. NOTE: If the Tracking Device does not perform well, or if it is sluggish in any way, the result will be a poor musical performance at the very least. Poor Tracking can also cause the player mechanism to malfunction. NOTE: Basically speaking, the first set of perforations on the Test Roll are designed to test the function of each note. Each note should sound five times in a "Da-Dit-Dit-Dit-Dit" manner. List all of the notes that do not perform properly. Click Here to see a list of possible problems with notes that do not perform correctly. 1) Rewind the roll to the beginning. Set the Tempo to '70'. Put the unit in 'Play'. 2) As evenly as possible, pump the treadles and listen to each note as it plays. All the notes should play at the same volume level. List all inconsistencies. NOTE: Although this test is primarily used to properly adjust the Air Motor Governor, it can tell you quite a bit about the entire drive line between the 'governor' and the 'take-up spool'. For now, I will only explain how to perform the test. 1) Leave the Tempo set to '70'. 2) Rewind the roll to the beginning of the Note Test portion of the roll. 3) Have a Stop Watch or a Wrist Watch with a Second Hand readily available. 4) Start pumping at a normal playing rate. 5) At Note 8, notice the horizontal mark on the music roll. 6) Start the stop watch (or note the position of the second hand) as that line passes over the note holes, and keep pumping. 7) At Note 46, notice the second horizontal mark on the music roll. 8) Stop the Stop Watch (or note the position of the second hand) as that line passes over the note holes. Write down the amount of time that has elapsed. 9) In a perfect world, it should take exactly 30 seconds for the music roll to travel 3-1/2 feet, from Note 8 to Note 46. NOTE: As the name implies, this test checks the repetitive ability of both the player mechanism and the piano action. In most cases, if the mechanism fails this test, there are problems with the valves or the regulation of the player mechanism. However, it is also possible that the problem is related to the regulation of the piano action. If you are in doubt about the regulation of the piano action, consult with any regular piano tuner. After performing a few very simple tests, they can tell you if the piano action is properly regulated. 1) Leave the Tempo set at '70' and pump the treadles so that the volume of each note is as soft as possible. Pumping the treadles hard or fast can mask repetition problems. As each perforation passes over the trackerbar, the corresponding notes should articulate evenly. Note all inconsistencies. NOTE: As the name implies, this test checks the uniformity of the scale from Note 4 to Note 84. What this means is that the volume of each note should be the same as every other note. The volume should be 'uniform' from one end of the scale to the other. Most 'uniformity' problems are related to improper regulation of player action or the piano action. 1) Leave the Tempo set at '70' and pump the treadles so that the volume of each note is as soft as possible. Pumping the treadles hard or fast can play the notes so loudly that it will be difficult to determine which notes are louder or softer than the rest. Note all inconsistencies. NOTE: This test is designed to give you a good idea about how the unit will perform under normal-to-heavy usage. Unlike the previous portions of the Test Roll, this section plays numerous notes at the same time. 1) Leave the Tempo at '70' and pump the treadles normally (as though you are playing a regular music roll). 2) Play through the first portion of this test, which plays as series of large chords, in a normal fashion. Take note of how the tension of the treadles changes as the large chords play. You might have to pump a bit faster (or harder) to keep the volume uniform. This is normal. 3) The next portion of this test plays a rather large arpeggio with an automatic sustain right in the middle of the run. This is to test whether or not the auto sustain comes on and goes off quick enough. If it does, the arpeggio will sound rich and full without being muddled. 4) The very last two chords are quite large. Just as the second to last chord is about to sound, pump one of the treadles very hard and then stop pumping. If everything in the system is in good shape, the second to last chord will sound loudly and the very last chord will play softly. 5) If your player piano does not have an Automatic Reroll device, move the Play/Reroll lever to the Reroll (or Rewind) position and rewind the roll. If your unit has an Automatic Reroll Device, resume pumping. In a few seconds, a number of holes on the extreme right and left edges of the roll will appear. As they pass over the trackerbar, the Auto-Reroll device shift the transmission from Play to Rewind, and the roll should start rewinding automatically. Below is a list of the various problems that could cause a note not to work correctly. Some of these problems are relatively easy to correct. Therefore, for simplicity sake, the corrective action is included here. As time permits, I plan to link the other problems to a web page that will endeavor to explain how to correct the problem. 1. Paper Dust and Debris in the trackerbar tubing and the bleed cups. Remedy: "Pump the Bar"
2. Pinched, collapsed, or bent trackerbar tubing. Remedy: Visually inspect effected notes. Correct as needed. 6. Broken or deteriorated leather nuts at striker rods. The above tests are merely the major aspects of a player system that can be checked and/or tested by using the QRS Test Roll. I often use the roll to troubleshoot normal problems like intermittent or leaky valves, and odd problems like incorrect tubing of the trackerbar or leaky exhauster flaps. In the hands of a qualified technician, or an experienced user, the Test Roll can even be effectively used to check the regulation of the player and piano actions. The point is, THE TEST ROLL IS A VERY IMPORTANT TOOL. Recently, the question was asked: "How many repetitions per key does your test roll (46016) have for each note and what is their spacing? I assume that it will work on the Ampico piano." As for the repetitions, there are 5 per inch. One "da" and four "dits" in the first portion of the roll starting at note 3 and ending at note 85. In the second portion of the roll, there are eight "dits" per 1-3/8" starting at note 85 and ending at note 3. The spacing between the "dits" is 1/8". In every case, the "dits" measure 5/64" in length. A "da" measures 13/64" in length. All of the perforations are rectangular. Their width is 1/16". In the repetition portion of the Ampico test roll, there are five "dits" and one "da" per 1-3/16". However, the "dits" are circles that have a diameter of 9/128" (0.070"). The spacing between the "dits" is 9/64". Based on the above information, simple math dictates that the QRS Test Roll would be more challenging with regards to repetition because the "dits" are spaced closer together. This finding is augmented by the fact that the tempo is suppose to be set at 70 during the repetition portion of the test. However, the square area of the rectangle is 0.0048 square inches, and the circle is 0.00385 square inches.